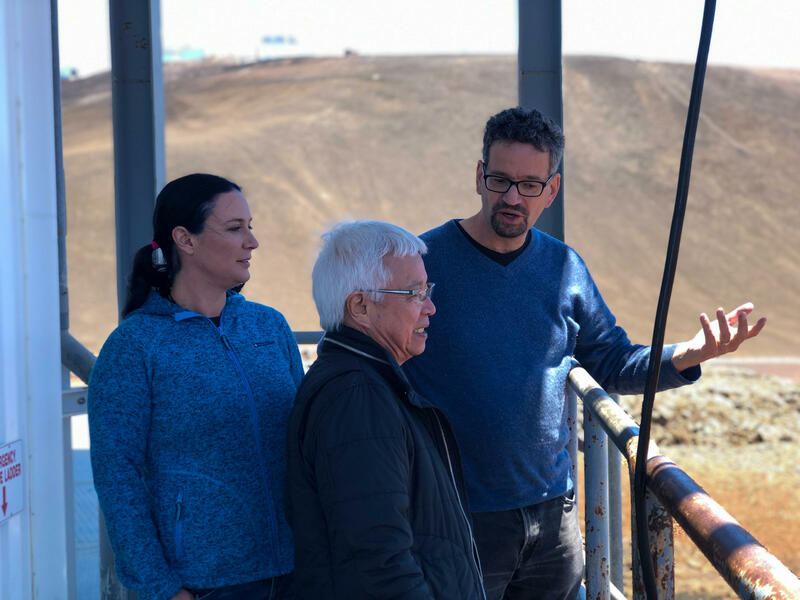 Left to right: Astronomer Geoff Bower, Hawaiian language professor Larry Kimura, and astronomer Jessica Dempsey - all get close up with the Submillimeter Array atop Mauna Kea. Scientists unveiled a snapshot of a black hole some 55 million light-years away from Earth. Black holes have eluded astronomers for more than a century since Einstein first theorized their existence. Hawaiʻi-based astronomer Geoffrey Bower participated in the discovery. 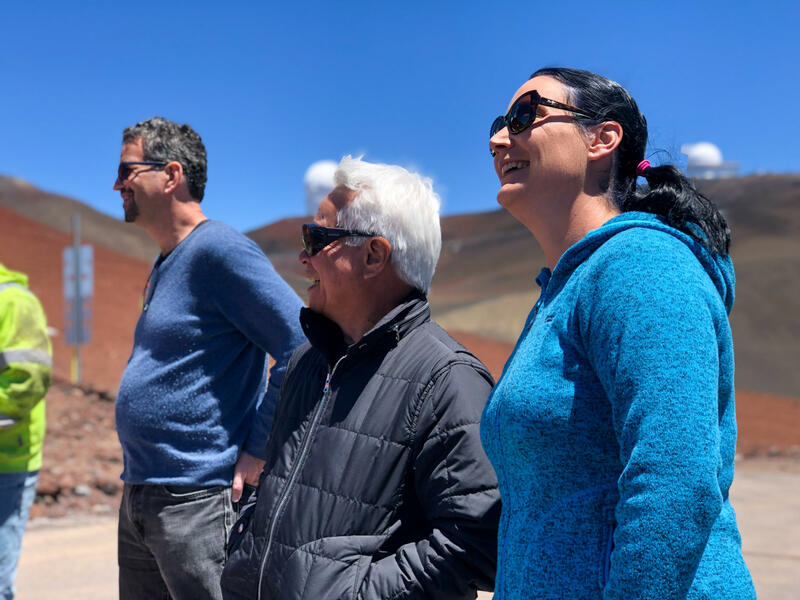 Astronomers Geoff Bower (right) and Jessica Dempsey (left) describe the newly-discovered black hole to renowned UH Hilo Hawaiian language professor Larry Kimura (center) atop Mauna Kea. The discovery was quite possibly the worst kept secret in the scientific world leading up to the international announcement. 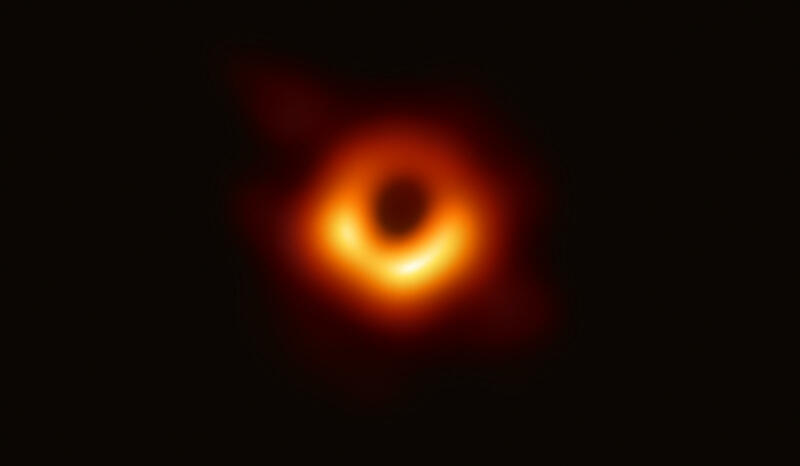 The image of the black hole looks like a blurry ring of fire shrouded in darkness. “What we are seeing is the light that is bent by the strong gravity of the black hole,” says Bower. Mauna Kea's James Clerk Maxwell Telescope and Submillimeter Array were two of eight telescopes around the world used to capture the first ever image of a black hole. 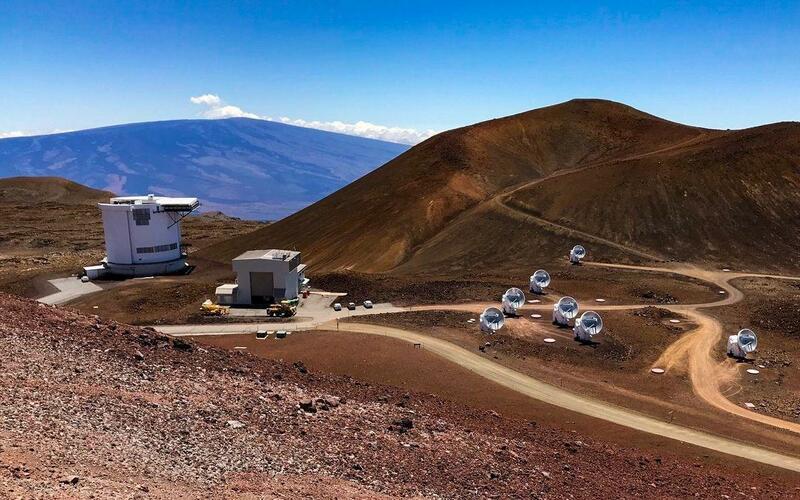 Astronomer Jessica Dempsey works on Mauna Kea’s James Clerk Maxwell Telescope. Her telescope as well as Mauna Kea’s Submillimeter Array where Bower works joined six others around the world to produce the picture. 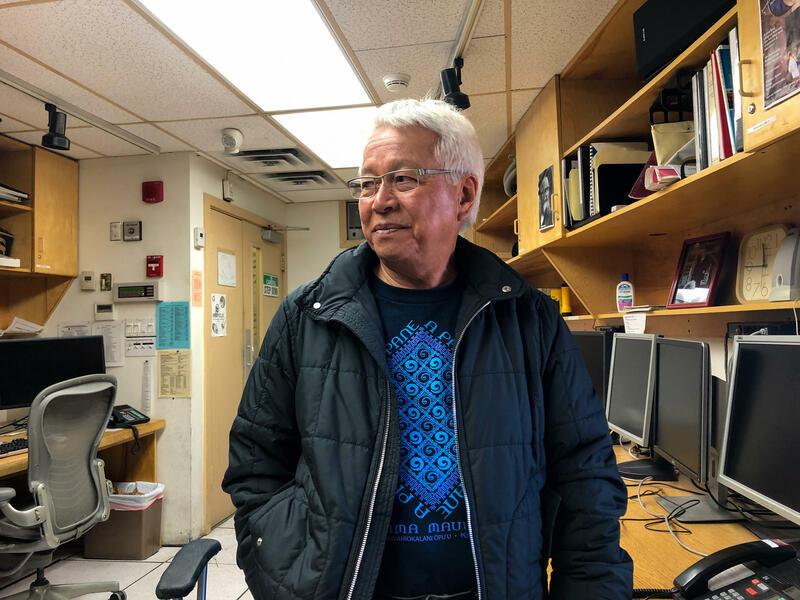 UH Hilo Hawaiian Language Professor Larry Kimura worked with Mauna Kea astronomers to name the newly-imaged black hole Powehi. The black hole will bear a Hawaiian name “pōwehi” meaning this embellished dark source of unending creation. Astronomers collaborated with renowned UH-Hilo Hawaiian Language professor Larry Kimura for this name. “ʻO kekahi mea i kū i ke ʻano o ka lāua wehewehe ʻo ia hoʻi inā ʻaʻole i loaʻa kēia ʻano wehiwehi ma haʻi o kēia pō, ʻaʻohe kino maila ke kiʻi,” says Kimura. What stood out to me when they described this black hole was that without this “wehi” or adornment of light in the darkness, no image could be produced. 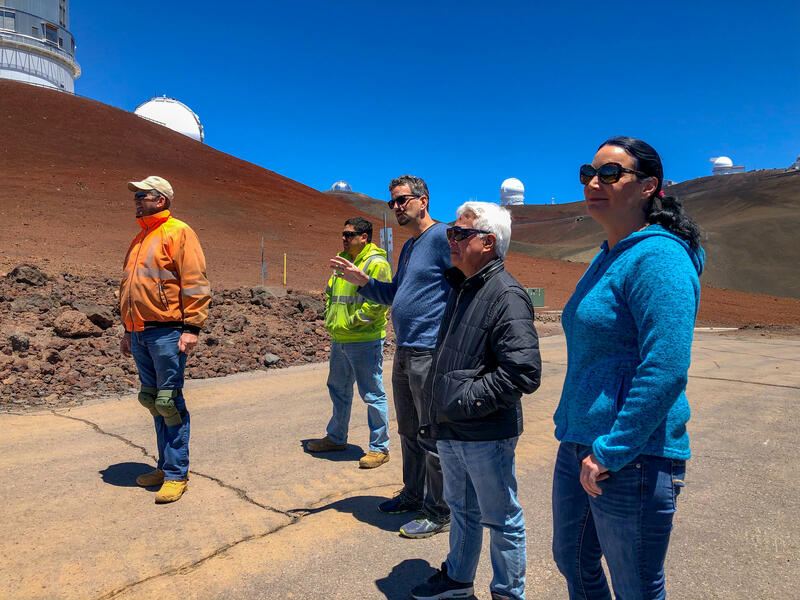 Astronomers join Hawaiian language professor Larry Kimura for a close-up look at the Submillimeter Array up on Mauna Kea. “The first thing I thought was with one word in Hawaiian, he’s described what took us six research papers of science to say,” says Dempsey. Pōwehi has its origins in the Kumulipo – a chant about the origins of the world from a Hawaiian perspective – and one that starts in darkness. “Mea nui ka pō iā lākou no ka mea hōʻike wau ʻaʻole na kākou ka poʻe o kēia wā i ʻike i kēlā ua ʻike mua ʻia e ka poʻe i mua o mākou, ka poʻe Hawaiʻi, ka ʻike Hawaiʻi i paʻa,” says Kimura. The power of darkness was revered and scientists aren’t discovering something new as much as validating ancient Hawaiian wisdom. Kimura says there are hundreds of forms of pō or darkness in this ancient chant. To which Bower says there are likely hundreds of black holes waiting to be captured. The planets Venus, Jupiter and Saturn are all visible this week, and we return to the Mauna Kea summit for a collaborative discovery relating to a black hole as HPR All Things Considered Host Dave Lawrence speaks with Christopher Phillips from the Mauna Kea Astronomy Outreach Committee for this week’s Stargazer.